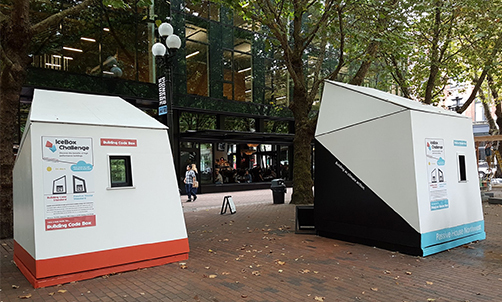 The Seattle Ice Box Challenge launched September 10 at Occidental Square and runs for 20 days. The North American Passive House Network is planning its own Ice Box Challenge to coincide with the organization’s national conference, October 4-8, in Oakland, California. Passive House Canada has be contacted by a number of municipalities in Canada interested in running similar challenges next year. Photo: Seattle Ice Box Challenge; credit: Shaun St-Amour, Footprint Sustainable Housing Corp.